Next week we've got another Domestic Debate on how the world of fashion influences our homes and interiors. 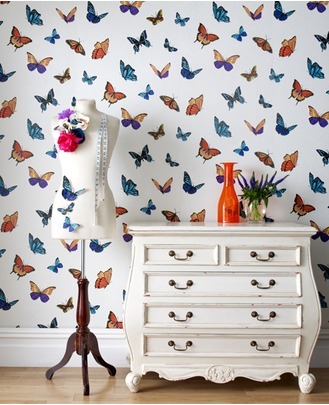 In the case of Julien MacDonald's wallpaper, it influences it rather prettily. Yep, this is one range of fashion designer-does-interiors that I really like. I love the colour on the black paper. 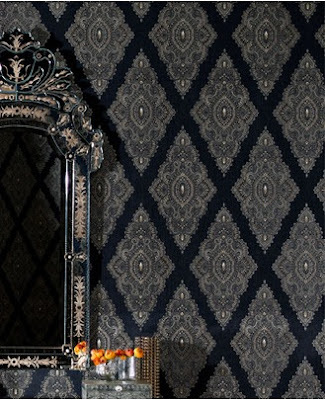 It's not easy to find a dark wallpaper that livens up a room, but this one does it perfectly. It comes in white as well. It's called FlutterBy. Say it in a Welsh accent, that's fun. There's sparkly details in this wallpaper. It's bold, but I kind of love it. And then it all goes a bit wrong. No, Julien. Just no. It's even flocked. Urgh. The Julien MacDonald range is available from Graham & Brown and starts at a very reasonable £30 a roll. 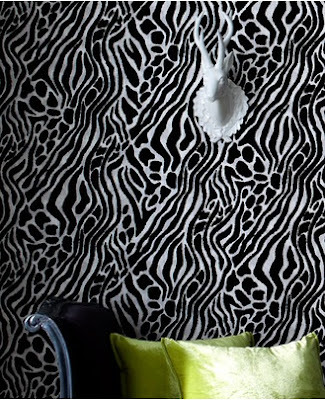 Just avoid the zebra print. Hmmm, it is beautiful but it also A LOT like Nina Campbell's Farfalla wallpaper. I used it last year and it looks stunning. oooh that is pretty too! 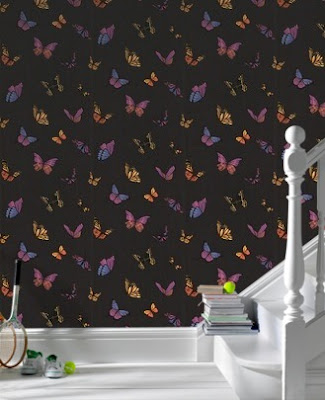 LURVE the butterflies - really pretty. just can't decide which I prefer....black background or white background?? ?